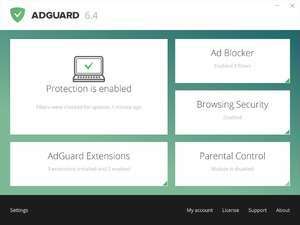 Adguard is a advertisement blocker which is fully functional and compatible with all of the major web browsers including Google Chrome, Chromium, Internet Explorer, Firefox and Opera. On top of being fully compatible with the major web browsers, Adguard also works with the lesser-known browsers like Yandex.Internet and Palemoon. Installing an Adblocker like this one helps save on bandwidth costs and even more importantly, seriously increases the speed at which you can browse the Internet, making even a 56K modem feel much faster on a good day. Adguard 6.4.1814.4903 is a shareware program and can be used as a demo to try the software until the free trial period has ended. A full version of the program is available after the trial period ends. For security reasons, you should also check out the Adguard download at LO4D.com which includes virus and malware tests. Additional screenshots of this application download may be available, too. Adguard Web Filter has a presence on social networks. Adguard Web Filter download been highly rated by our users.